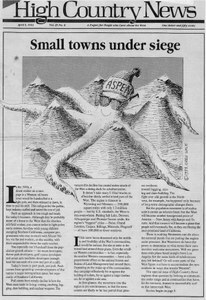 Aspen, Colo. grapples with the angst of being a rich resort town, a mill closure shakes Kremmling, Colo., Livingston, Mont. is caught off-guard by its popularity, and the West is transformed byte by byte. Growth in Aspen reverberates throughout the state. Technology helps small businesses blossom in the rural West. A sawmill shutdown prompts community planning and a new economic base in Kremmling, Colo.
Montanans plan to preserve their small-town atmosphere in Livingston. Small towns in the West are threatened by urban refugees and other newcomers. Aspen culture bewilders its Hispanic work force. A booklet titled 'Six Myths About the Future of Small Towns' suggests small towns shouldn't court industry. Small towns are an important part of the ecosysytem, according to community consultant Luther Propst. Accelerating growth worries locals in Dubois, Wyoming, and Glenwood Springs, Colorado. An essay on the economics of the development of the frontier. A biography of a 19th century Colorado rancher. How Boulder's rejection of Peak Power Corp.'s hydro plan preserves the town's vision. A Montana subdivision becomes a sprawling development outside Yellowstone. Navy target practice stops at a Washington coast wildlife refuge. Once a road always a road? An1866 mining law ensures access to public lands. Mushroom harvests in the Northwest may be harming forests. A letter to the editor of a California paper criticizing range conditions causes a $32,000 libel suit. Eagles and salmon are at odds with hydropower and each other in Idaho. Evidence of a wolf that roamed into Yellowstone suggests reintroduction is unecessary. Diminished reservoirs slow salmon migration and hike power prices in the Pacific Northwest. Depleted uranium bullets threaten radioactive contamination on military testing ranges. Will Zion, the movie, hurt Zion, the park? An Imax theater will soon stand at the entrance to Zion National Park. A Dept. of Agriculture brucellosis study on Yellowstone bison is stopped by court order after intervention by the Fund for Animals. The United Nuclear Corp. must clean up its Church Rock Mine near Gallup, New Mexico. Environmentalists build a coalition to protect their interests in the Wyoming Legislature. The Animas Foundation buys New Mexico's Gray Ranch.